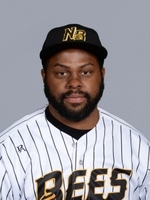 Jason Rogers returns to New Britain for his second season in the Atlantic League and 10th of professional baseball. Last year, the former Major Leaguer appeared in 107 games with the Bees, and posted a .297 batting average with 26 doubles, five home runs, 65 RBI, 53 runs scored, and a .397 on-base percentage. The 31-year-old began his professional career when he was drafted by the Milwaukee Brewers in the 32nd round of the 2010 MLB amateur draft. After five successful campaigns in the Brewers organization, he made his big league debut in 2014. Rogers spent two seasons in the Majors with Milwaukee from 2014-15, and with the Pittsburgh Pirates in 2016. In 117 career big league games, the slugger owns a .258 average with four home runs, 18 RBI, and 24 runs scored. Over the course of 867 minor league games, Jason has comprised a .286 batting average with 180 doubles, 94 home runs, 493 RBI, 448 runs scored, and a .369 on-base percentage.